A community where you can explore your faith, learn about justice and deepen your relationship with God! Lent is the "perfect time to come home to the merciful embrace of God," says Pope Francis. If we experience God's mercy, then we must in turn become a sign and instrument of mercy. In other words, we are called to life and called to love. The corporal and spiritual works of mercy bear concrete witness to our call to be merciful all year round, and not only in Lent. Our Lenten campaign's central image is that of a cross in Ciudad Juarez, on the border between the U.S. and Mexico. Crucified on it is the Holy Family. The plight of migrants and refugees is of utmost concern to the Church and Pope Francis at this time. We contemplate the dark desolation of Crucified Love, while the light of hope in the Resurrection sustains us. St. Ignatius Loyola, the founder of the Jesuit Order, understood his mission to be that of “caring for souls”. 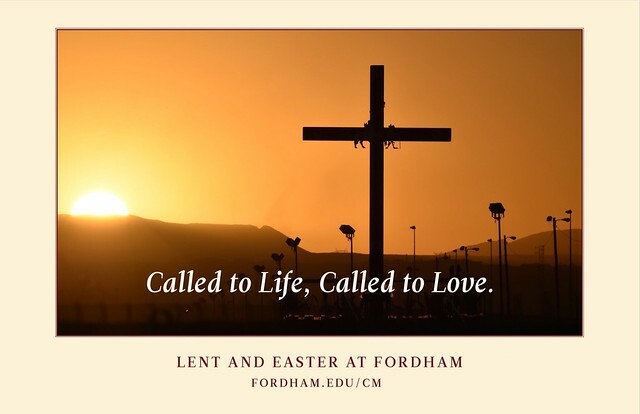 Campus Ministry continues that mission today by offering opportunities for you to engage both your heart and mind as you explore what you believe and how that informs what you hope to do with your Fordham education, and what kind of Fordham Graduate you will become. Rooted in our Catholic and Jesuit identity and animated by our Ignatian tradition of encountering God in everyday life, we are a community where people of all faith traditions are welcome. Whether you are Catholic, Jewish, Hindu, Orthodox, Christian, Muslim or exploring, we invite you to one of the many Campus Ministry events we offer throughout the year and explore one of the many clubs and organizations that call Campus Ministry home.